Who’s Gunna Make Our Music? Gracie & Lacy’s Star Spangled Spectacular! All Events are Free, but offerings are accepted. Hear the work of English composer and organist John Reading when Pamela Meys Kane, Music Director/Organist at the 10,000 member St. Gregory the Great Catholic Church in Bluffton, South Carolina takes the stage. Kane opens the series with “A Trumpet Air.” The program will also include works by Bach, Franck, and Swinnen, and she’ll close the recital with “Concert Variations on the Star Spangled Banner” by John Paine. Jonathan Schakel is a DMA candidate in performance Cornell University, Ithaca, NY. He holds a master’s degree in organ and early music from Longy School of Music in Cambridge, MA. As a recitalist, Jonathan has performed in the Netherlands, Germany, Scotland, and throughout the United States. He also works as an advisor and collaborator with the early music vocal ensemble Zephyrus. Jonathan’s program on the Baroque inspired Gabriel Kney Organ will include a number of early pieces by Sweelinck, Scheidemann, Byrd, Scheidt, Buxtehude, and from the 20th century, pieces by Dutch composers Ed Wammes and Jacques van Oortmerssen. Dr. James F Mellichamp presents a recital of works on the Aristide Cavaille-Coll-style Bedientorgan, opening with Sonata in C minor, by Mendelssohn-Barthody, continuing with works by Bach, Grigny, Franck, Pierne, and closing witht he “Finale” from Symphony No. 8 by Widor. Mellichamp, the President of Piedmont College, has performed organ recitals throughout Canada,Europe, Asia, and the United States and received a Doctor of Music degree from Indiana University, Bloomington. “Festal Flourish” by Gordon Jacobs comes to life under organist Richard Gray. The Director of Music for St. John the Evangelist Episcopal Church in St. Paul, Minnesota, Gray holds degrees in organ performance from Southern Methodist University and Oberlin Conservatory of Music and brings this piece to life with a recital on Casavant-Freres organ. Other selections will include Phillips, Bach, Alain, and two movements from Symphony No. 3 by Vierne. On the refurbished 1967 Austin organ, Eli Roberts, the Associate Director of Music and Principal Organist at St. John Vianney Catholic Church, Houston, will play a variety of selections by composers Bach, Sibelius, Whitlock, How-ells, and Locklair. The recital will close with the stormy “Tu es Petra” from Esquisses byzantines by Henri Mulet. Roberts holds a Master of Music from the University of Houston and a Bachelor of Music from Utah University, Logan. Enjoy “Piano Concerto,” the only masterwork by Witold Lutosławski, and two pieces from Jazz Suite by Russian composer Alexander Tsfasman from acclaimed artists, Yuri McCoy and Yvonne Chen. Yuri opens the recital with Robert Elmore’s “Rhumba,” showcasing his virtuosic pedal technique. Yuri McCoy received a Master of Music in piano performance from the University of Hawaiiat Manoa and traveled to Leipzig, Germany, to study at the Hochschule Fur Musik und Theater “Felix Mendelssohn Bartotholdy.” Taiwanese-American pianist, Yvonne Chen, received a Bachelor of Music from the Juilliard School, a Master of Music from Rice University’s Shepherd School of Music, and is currently pursuing a doctorate in piano performance at Rice while on the faculty of St. John’s School, Houston, Texas. Dr. Gant is joined by two musicians from the Charleston Symphony in a varied program of solo organ works with duo and ensemble works featuring Torelli’s Trumpet Concerto, Rachmaninoff’s Vocalise, and the formidable L’essence dela Trompette by McPherson. Explore the sounds of Boely, Franck, Lefebure-Wely, and “Carillon de Westminster” by Vierne from St. Andrew’s Episcopal Church organist and choirmaster, John Walthausen. The musician,who attended the Concervatorie National Surerieur de Paris and has a master’s in historical keyboards from the Schola Cantorum of Basel,Switzerland, will end the recital on the French-style Bedient organ. Enjoy “The Rejoicing” from Music For The Royal Fireworks (La Rejouissance) by Handel, along with a commissioned piece by Paul Leddington Wright, and selections from “Pictures at an Exhibition” by Russian composer Modest Mussorgsky from Dr. Chuck Seipp and Dr. Randall Sheets. 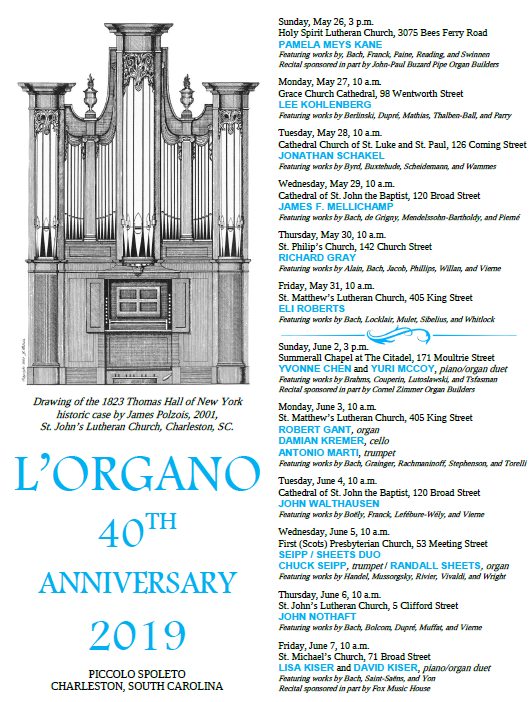 The trumpet player and organist, respectively, will perform on the Ontko & Young organ. Dr. Seipp is on the faculty of the Shenandoah University Conservatory of Music. He holds degrees from Kansas and The Catholic University of Americaand is a Yamaha Performing Artist. Dr. Sheets has been the Ceremonial Organist for Arlington National Cemetery for 20 years. He holds degrees from Wittenberg University and the University of Maryland. Listen to the music of Vierne, Bach, Mendelssohn-Bartholdy, Bolcom, and Dupre as John Nothaft, director of music at Lewinsville Presbyterian Church in McLean, Virginia, performs at St.John’s Lutheran Church. The first prize winner of the National Federation of Music Clubs Collegiate Organ Competition and recipient of the NPM member’s scholarship has performed overseas at Truro Cathedral and Chester Cathedral, UK, St.Mark’s Cathedral in Seattle, Washington, and on Pipedreams Live! David is an adjunct professor of Piano and Organ at Anderson University, in Greenville, and is the keyboardist for the Asheville Symphony Orchestra 2018-19 season. Lisa is the Beth Marr Lee Endowed Chair Principal Keyboardist of the Greenville Symphony Orchestra and is also on the music faculty of Anderston University. She graduated from Yonsei University, South Korea,and has completed the coursework for the Doc-tor of Musical Arts at USC.